#BravoIscileriIcinAdalet or 'Justice for Bravo workers'. "I made the thing you want to buy this, but my wages are not paid!" Buyers in the Zara shops in Istanbul find these unusual tags tucked into the clothes, hidden in the folds of jeans or in a jacket pocket. But who infiltrated the secret messages of a prisoner in the Second World War drama? The tag is inserted by Bravo Tekstil's workers, the Turkish company maker of Zara products and other major international brands such as Next and Mango. The factory went bankrupt overnight in July 2016, and workers say that their wages in the period leading up to the plant closure were not paid. Now they ask Zara to compensate them and pay three months of unpaid wages plus severance pay. "One morning we came to work, and the company was gone.the windows were closed, our boss vanished," said Filiz Tutya, one of the Bravo Textile workers. "We have no choice but to run this action.We slip this tag on all the products in every Zara store in every shopping mall in Istanbul We do not want to harm Zara This is not the case, but we want what we are entitled but not paid. " 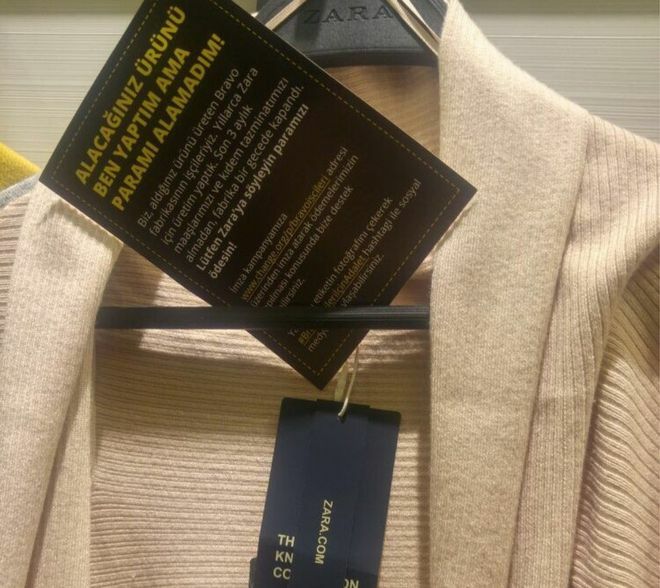 The workers demanded Zara's responsibility after their local supplier factory went bankrupt. Another worker, Betul Sahin, said, "Some of us have to postpone marriage for financial reasons, some are unable to send their children to school." "Maybe that big money is not a big deal for most people, but for us every peser is worth it.We worked very hard to get it We asked Zara: 'Why do not you pay us? Why do not you give us our basic rights? Since the campaign began, thousands of people have sent social support messages using the suggested tag, #BravoIscileriIcinAdalet, which means "Justice for Bravo workers". Online petitions have been signed by over 270,000 people. These unusual messages were tucked into clothes, hidden in folds of jeans or in jacket pockets. Parent company Zara, Inditex, said that they have paid to Bravo Textile all their obligations, but the money does not flow to the pockets of workers. The company said that along with Mango and Next they set up a 210,000-euro allowance fund to help the most vulnerable and needy workers. 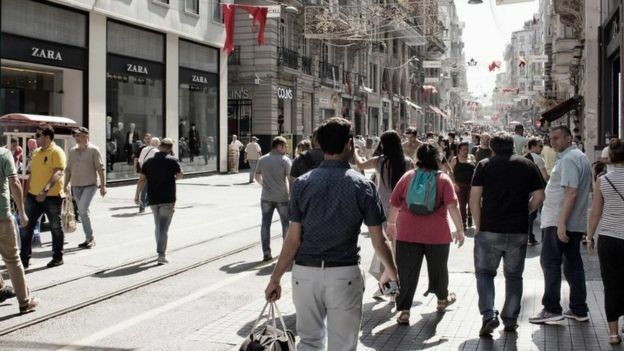 "There is an unjust suffering here and we deeply regret that these workers have to endure all of this," said Murat Akkun, of Inditex Turkey. "But it was not us who caused this suffering, but the local company, and the boss of the company escaped." The Turkish court needs to find this man and force him to pay all his obligations. " 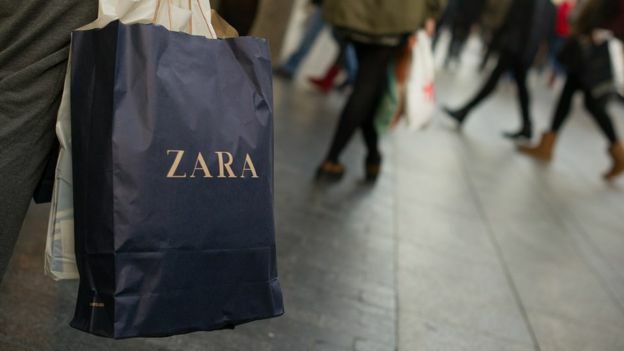 Zara also said that they "immediately took steps to assist the workers in this unfair situation and Inditex remains committed to being part of a joint effort to find solutions for workers". The trade union representative of DISK Tekstil, underlined that if Inditex does not compensate every penny of labor-wage pennies, their campaign will continue. "Zara announced to the whole world that they are responsible for every worker who produces their goods, but the funds they offer only cover a quarter of the loss of burujh," said Asalettin Arslanoglu from DISK Tekstil. "There are cancer patients among these workers, some suffer a stroke, if they do not pay all 153 of these workers, we will continue to do this campaign." Previously, Zara was once accused of slavery, hiring child labor, and exploiting Syrian refugees as cheap workers. Spanish-based Inditex is one of the largest fashion retailers in the world. They have 7,405 stores and employ 162,450 people. Previously, Zara became the target of criticism when accused of slavery and hired child laborers, and exploited Syrian refugees as cheap workers. 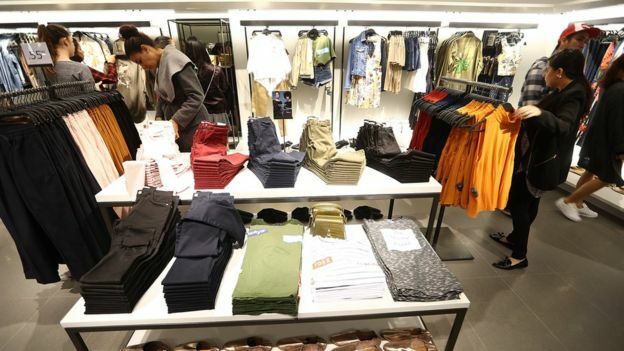 The Inditex Group promises to investigate the incidents and strengthen oversight of their suppliers' production facilities. 0 Response to "Worker smuggled messages on Zara's product: 'My pay is not paid'"